Jack turned 6 and requested an Angry Bird party. We had a small party at home which was a great relief to me and less stressful for everyone involved. The kids ran through the sprinklers while we grilled and later in the evening we had our dinner with cake and presents. I thought I would try working with fondant for the first time so I ordered a chocolate cake with a chocolate mousse filling from costco (delicious, by the way) and requested that they frost it and only pipe the edging and leave the rest of the cake blank. I wasn't sure what all supplies I'd need for this but in the end, the essentials were a new x-acto knife, a wood imprint mold for the slingshot and blocks, a flat mat to use while cutting the fondant with exacto knife (I used the back of the imprint mold), a Wilton 12 icing color set, green and blue Color Mist Food Coloring for the grass and sky background, a set of round fondant cut outs, Wilton Candy Eyeballs and finally pre-made white fondant. The fondant figures took about 6 hours start to finish. I pulled up images on Google for reference and I based the design from a cake I saw on Pinterest. All in all it was a low stress party that the kids enjoyed a ton and all the food turned out great. A big success in my book. 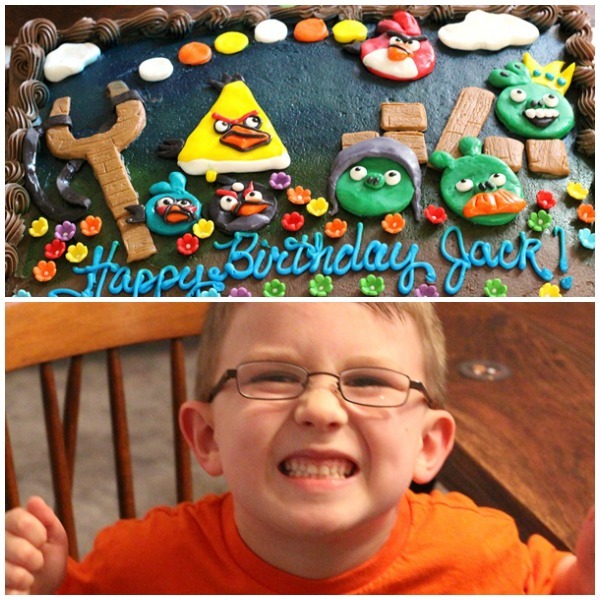 Jack looks very happy with his fabulous party and wonderful Angry Bird Cake. Well done.